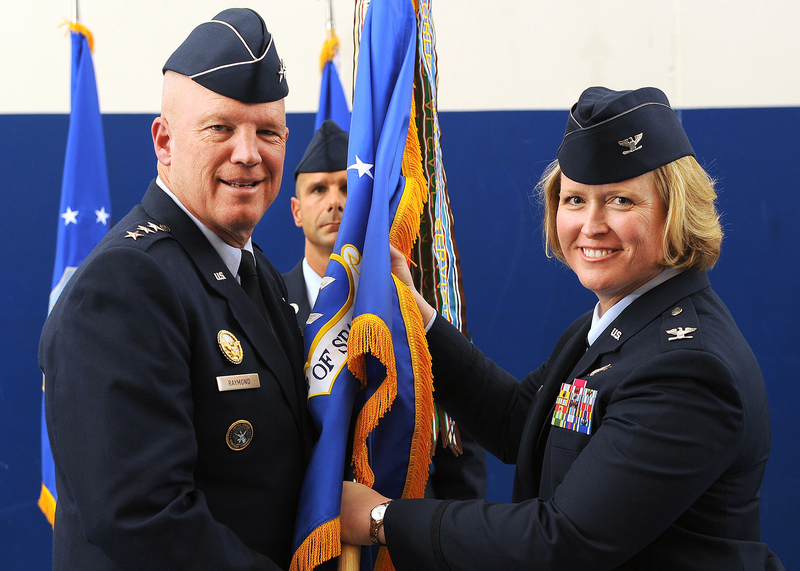 June 4, 2015 – The 50th Space Wing welcomed new leadership during a change-of-command ceremony held at Schriever Air Force Base on May 29. U.S. Air Force Lt. Gen. John W. “Jay” Raymond, commander, 14th Air Force (Air Forces Strategic) and Joint Functional Component Command for Space presided over the ceremony that transferred command of the 50 SW from Col. William J. Liquori Jr. to Col. DeAnna M. Burt. Prior to relinquishing command, Liquori addressed his fellow leaders, wing members and community partners. Burt returns to Schriever, leaving her post at Air Force Space Command as Director of the Commander’s Action Group. Burt was previously assigned to the installation as the 2nd Space Operations Squadron commander and has commanded at the flight and group levels along the Front Range. As wing commander, Burt will be responsible for more than 4,200 military, Department of Defense civilians and contractor personnel serving at 14 operating locations worldwide and operating 69 surveillance, navigation and timing, space situational awareness and communication satellites valued at more than $66 billion. The wing’s Air Force Satellite Control Network supports a total of 175 satellites from multiple government agencies. Burt will also serve as the installation commander hosting approximately 20 mission partners whose combined economic impact is approximately $1 billion. After two years in command here, Liquori is transitioning to his new post as the Senior Military Assistant to the Under Secretary of the Air Force in Washington D.C.